Last week I wrote about our surprise encounter with a tiger from the wild in Kumaon Surprise. Today let me share another wild encounter story. We were on our way back from Wayanad, a little hill station in Kerala to Bangalore. Read my Wayanad Story. You have to cross the Bandipur Tiger Reserve on your way. While driving back we saw a few cars parked on the side of the highway. This isn’t a place you park your car! Instead of stopping and adding to the queue we decided to drive past few cars. What we saw ahead was a sight to remember. A wild elephant had some out of the forest and was being busy by the road. Two guys on a bike decided to show their bravado or rather foolishness and decided to tease the big guy. They honked and made weird sounds. The elephant was silent for some time. But then I guess he too quite had it! The poor animal was getting irritated with the sound and in a split second charged towards them. The guys on bike tried to speed off! In the heat of the moment they almost did a willy to vanish from there. Sometimes I feel bad how humans try to find amusement by instigating the wild animals! 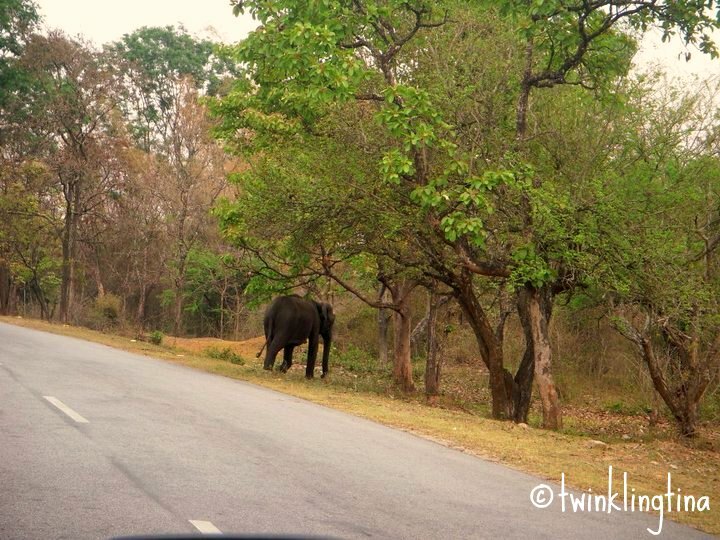 I managed to click a photo of the elephant while he was retreating to the forest! This post is written for the A to Z Challenge 2016 for Day 23 Letter W. Visit A to Z, BlogChatter to read other beautiful bloggers! Those guys were pretty stupid. Yes, antagonize a creature that weighs a few tons and can crush you like a bug. How crazy is that! It can be absolutely daunting and paralyzing I imagine to see a huge animal come charging at you! And sadly, the same issue still persists… especially with this intolerable heat presently. Such idiots and good you share the story. Who knows, sense will be knocked in the head of those indulging in cheap thrills!! I think you get people being stupid around wild animals no matter where in the world you are. I am glad he was not hurt. Thanks for sharing your photo of the beautiful elephant. Glad no one was hurt… some people need a lesson on common sense. I thought about how we are so stupid and bad behaving, animals are our pure joy and we should pay them a full respect. Haha this reminded me of the time we went to Corbett. We couldn’t sight any tigers so the tour guide showed us hot elephant poo! On a side note, humans can be the worst. It is very insensitive to behave like this in the wild. These evil creatures get punished in some way or the other in the wild for sure.